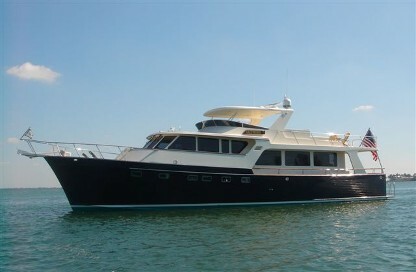 The ME 65C introduced Marlow Explorer Yachts to the world in 2001. It has been, and continues to be, a very popular model. Because of our superior architecture eliminating the need for interior bulkheads, we can satisfy the layout needs of all of our owners. The reintroduction of the ME65C in 2006 brings Marlow Explorer's credo "Each one better than the one before" into the spotlight. The new ME 65C has shed 4,500 pounds due to the use of our proprietary RIVAT© system of lamination, a registered acronym for resin-infused vacuum assisted transfer in the construction of the yacht. (Read about this technological system of infusion by clicking here.) 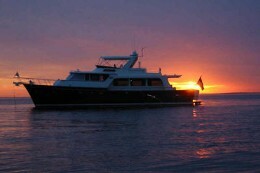 The weight loss results in increased strength, greater fuel efficiency and better performance for the yacht. In the factory, after the initial investment in new tooling and machinery, a savings was seen in the number of man-hours and materials. The new 65C can explore much farther due to the increased fuel capacity and the lighter weight. A unique fuel-delivery system on the new 65C employs a single valve to direct all fuel distribution, significantly increasing efficiency. The exhaust system has been modified for extremely quiet operation by counteracting the higher sound levels created by the revolutionary turbo engines. Farther and quieter! In the engine room, several significant changes have enhanced this new 65C. A sophisticated air intake system eradicates moisture and salt limiting damage from these insidious elements. A new system of mounting the engines on stainless steel mounts running across the tops of the fore and aft stringers has resulted in decreased vibration while spreading the weight load of the engines over a greater area of the yacht. The ME 70E brings the European transom styling to the 65C, while featuring the same interior configurations, the same luxurious furnishings and the same outstanding architecture. The Euro transom is a styling preference that provides a slightly longer yacht, a larger swim platform and a stairway to the aft deck that is as elegant as it is functional. The command bridge has eliminated the need for a lower station allowing for a grand dinette with seating for eight. 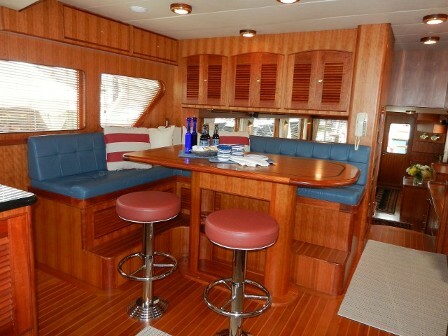 The command bridge with its panoramic view has a large lounge area for very comfortable gatherings and its own wet bar and refrigerator for convenience. Below decks, there are three well appointed staterooms. The master glows with recessed lighting, extensive hanging locker space and beautiful cabinetry. The VIP is a luxurious retreat for your guests with its glowing cabinetry, queen size bed and private head. Our signature detailing is evident throughout - from the curved Lexan shower door to the lovely Grohe Infinity fixtures. 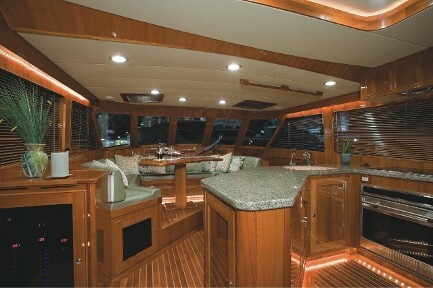 The Command Bridge models allow for more varied layout options in the pilothouse. 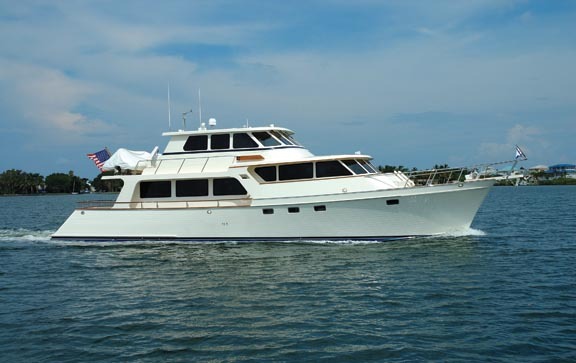 The expansive space provides ample room for a dinette comfortable seating for eight in the fore section with the galley in the traditional U-shape in the afrt section of the pilothouse. A lovely alternative layout places the galley in the fore section in a wide U-shape with either a large settee facing the bow with a glorious view out the windows or a more formal dining table with cabinetry next to and behind. 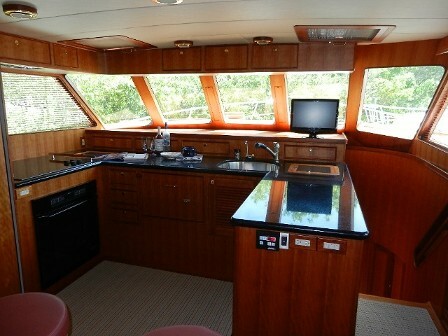 Above, a large comfortable dining area in the forward pilothouse with the typical galley u-shape layout aft on hte starboard side of the pilothouse. 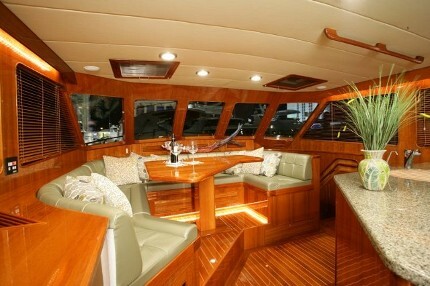 Below, the dinnette is in the aft section of the pilothouse, facing the galley which is located forward . 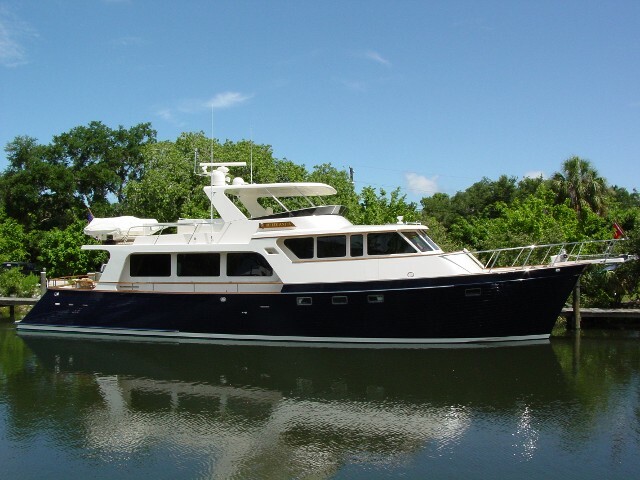 This galley features an upright refrigerator, but the Sub-zero drawer models are a great option to preserve the large, open feeling of the pilothouse.